In a large bowl, stir together flour, cinnamon, baking soda, and salt. Stir in walnuts. 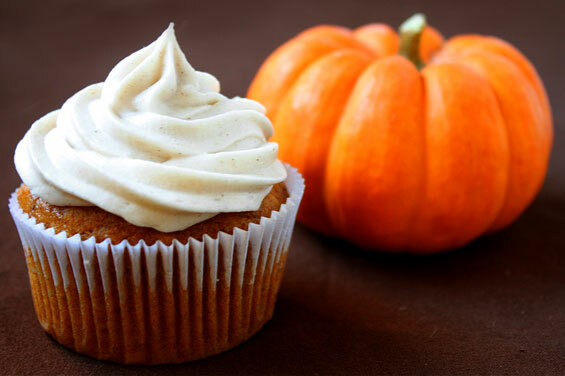 In a separate bowl, blend pumpkin, honey, oil, eggs, buttermilk, and vanilla until smooth. Pour pumpkin mixture over dry ingredients. Stir just until mixed. Spoon batter into paper-lined muffin cups, filling each 3/4 of the way full. Bake at 350°F for about 25 minutes or until a toothpick inserted near the center of muffins comes out clean. Let pan cool on a rack for 5 minutes. Remove muffins from pan and let cool on rack completely. In a small bowl, with an electric mixer, beat 8 ounces cream cheese (softened to room temperature) with 1/3 cup honey, until fluffy. Next Healthy Trick or Treats? Yes, Please!